Asheville is set in an enviable spot that was likely to draw great folks, culture, and commerce, come what may, but the city didn’t make itself. A diverse cast forged this ever-changing mountain jewel over a stretch of more than 200 years. In Legendary Locals of Asheville, Asheville native and historian Kevan Frazier gives the city’s formative characters their due in an account that’s both expansive and concise. It’s a quick, affectionate, and thorough look at Asheville’s many major players through the years that doubles as one of the best collections of photographs of the city’s notables. Frazier smartly organizes the story of Asheville’s rise around themes ranging from early settlers to artists, authors, and musicians, from Biltmore’s key early role to educators and humanitarians. Throughout the book, Frazier addresses the challenges and successes of Asheville’s white founding fathers and its African-American vanguard. This fitting and rare effort to chronicle the city’s diversity extends to champions of Asheville’s civil rights movement. Frazier wraps it up with a chapter on “The Rebuilders”—the guiding figures of the 1980s and ’90s who helped Asheville transition out of its post Depression-era debt. It’s a testament to the relevance of his book that you can still encounter many of them on the city’s streets today. 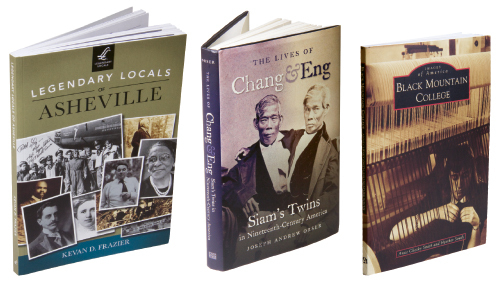 The fascination with “Siamese twins” was born in Siam and raised in North Carolina, thanks to Chang and Eng Bunker, who finally have their story told well and respectfully in a new joint biography. In retrospect, their journey seems something close to impossible: Born in 1811, the conjoined twins, banded together by a relatively thin stretch of flesh, were carted out of Siam as curiosities and even “monsters,” as they were widely called as at the time. Astoundingly, they settled in the North Carolina Piedmont town of Mount Airy, becoming land and slave owners and husbands to two farmers’ daughters, siring 21 children between them. The complexity and fullness of their lives deserves a full accounting, and now Orser has offered one. His book is a massive feat of archival and cultural research that humanizes Chang and Eng while telling much about the times in which they lived, struggled, and ultimately prospered. Black Mountain College is one of the rare institutes of higher learning that has gotten increasing attention since it closed. The college thrived from 1933 to 1957, and its influence still runs strong. The timing of this book is spot on, as it follows soon after the 2012 opening of the Western Regional Archives, a state facility in Asheville that now hosts reams of BMC papers and photographs that were long sequestered in Raleigh. Heather South, the western archivist, cowrote the book with Anne Chesky Smith, director of the Swannanoa Valley Museum. Black Mountain College opens new windows into the BMC experience, especially through the addition of a wealth of previously unpublished photos. It bursts with the energy of the lives that unfolded at the college, in both its academic aspects and the singularity of its daily life as a working farm and hotbed for artistic innovation.